Rouge Jolee is a scrumptious, spicy red blend of Merlot, Cabernet and Syrah. Easy drinking with a smooth silky structure, Rouge Jolee is cut above the competition with estate grown fruit, fancy French winemakers and elegant packaging. Beautiful, lush fruit flavors are layered with toasty oak and a rich round finish. 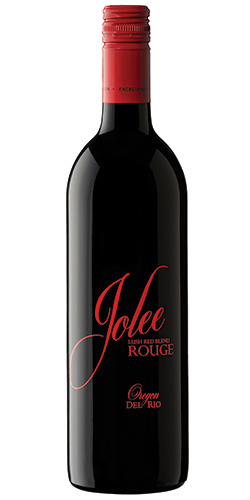 Attractively priced our Rouge Jolee is fresh new face in the red blend category. Great with black and blue burgers, smoked BBQ brisket, pepperoni pizza or an elegant steak Diane, Rouge Jolee is a versatile crowd pleaser to be sure.